Setup is easy. 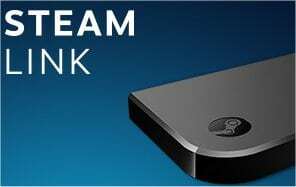 Just connect your Steam Link to your TV and home network, where it will automatically discover any computer running Steam. All that’s left to do is grab your favorite controller, kick back, and enjoy your collection of games from the comfort of your couch. Home network connectivity to both Steam Link and host computer.Wired network strongly recommended.